The storage of the best cigars requires an environment in which the fragile balance between humidity and temperature is maintained. 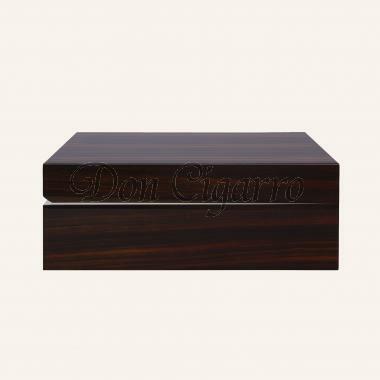 The right storage of cigars is and has always been one of our most important concerns. That's why Davidoff invented the humidor. 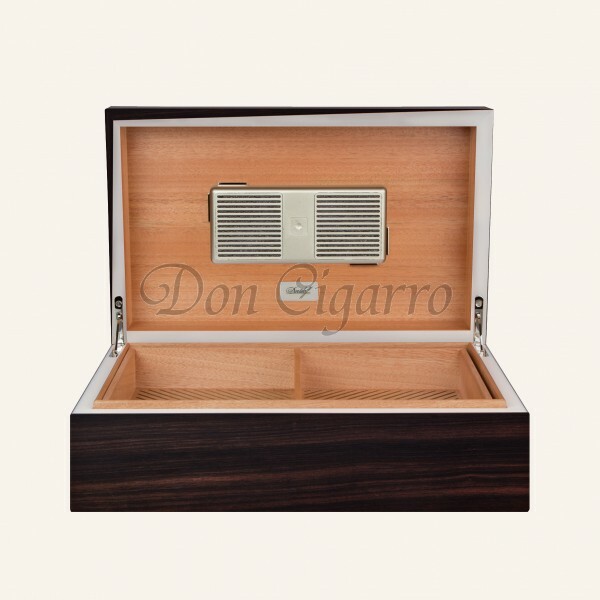 In a Davidoff Humidor, cigars are safe and stored at the best conditions. There is no better place for your cigar. The cut through the humidor "Ambassador" reveals a beige frame made of Staron®, an acrylic-based material. A leaf pattern decorates the inner cigar basket. The lid is slightly cut, reflecting the concept of asymmetry, as is the case with the tobacco leaf. The veneer is a Davidoff classic: Macassar, a dark, linear veneer suitable for an elegant and refined ambience. Davidoff signature on the outside of the humidor, discreet and elegant. Thanks to the exclusive self-regulating humidifier by Davidoff, an optimum relative humidity of 70-75% is guaranteed. When the relative humidity falls below the ideal value, the regulator releases moisture. If the value increases, for example due to external influences, the regulator absorbs excess moisture automatically. The inside is made of gabon wood, better known as Okoumé wood and originates from the west coast of Africa. This is odorless and tasteless. The Okoumé wood is hand painted to prevent it from being picked up by the wood instead of the cigars.